This is my follow-up mission in response to my blog post earlier this week "Chanel Paradoxal Rant!" I didn't find this franken difficult in the sense of finding what colors to use that was a piece of cake. I'll show what I use later. The difficulty with frankening this was that every photo I've seen of it is different. In some photos is more purple while others it's more grey. I think that is part of the allure of this color. To be honest, while trying to franken this I could begin to understand peoples attraction to it. However, regardless $23 is out of the question to me! I think the main differences with my franken is mine is more grey and the shimmer is a little more cool toned. I think I did capture the essence of the color. It's not dupe, but I think it does measure up as nice alternative. Plus it only will cost you around $5-$6 depending on what products you use! This formula should get you in the Paradoxal realm, but of course you can add a bit more of this or a bit more of that to perfect it the way you like it. I think if you like a color and you want to duplicate it, you shouldn't expect to get an exact dupe. You should make it the way you like it. If you like it more purple add more purple etc. There are not any rules just enjoy it. Frankening is fun way to save money and make your own fun creations! I hope this may of helped some of you out there who liked Paradoxal but didn't care for the hefty price tag! Let me say one thing, if you don't like to spend a lot on polish or don't find it necessary don't ever feel like you NEED a polish because there is a lot of hype around it. Of course, if it's something you want and don't mind the price, go ahead and get it :)! Paradoxal is a nice and great color, but it's not for me or my budget! 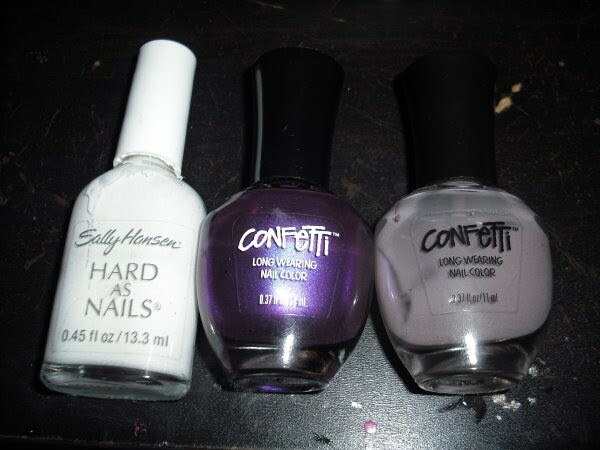 That's one of the reasons for my blog is to share nail products for those of us on a budget. I'm sure there are many others in this position so this was the reason for this post and my previous rant. I would say that's pretty close. I even like yours better. This is a very interesting post. I have never done a franken but would certainly consider it. Especially if it saves me around $15! I agree with Steffie, that I like your franken a bit more. Even though I 'want' Chanel's, I won't spend the money on it. Looks pretty close! Very pretty on ya! this is awesome! i haven't tried frankens yet, but this is just beautiful! your a bad mamma jamma! Jen- You should definitely try the franken! Nothing wrong with having 2 great colors? Kimberly- You can do a lot with those $15! Frankening is fun it's not something I do often but when I do I enjoy it and the results! Jamie K- Thank you so much for that compliment. I really appreciate it and it means a lot. Lacquerware- Thank you! I did slave over this for a bit! Midge- Frankening is fun. I think you'd enjoy it. Joan-Centerstage is actually purple one. Moonstruck is an average taupey-grey it's very similar to Sephora by OPI Metro Chic. I need to go get some Confettis and try this out, because I do like Paradoxal as a color, but I do not like that price. Very Pretty! I prefer your version to the original too. this is a great franken. But you're right, the allure of Paradoxal is that it IS a paradox. Sometimes its taupe. Sometimes its grey. Sometimes its chocolatey brown. Sometimes it is purple. Excellent! I like the look of Paradoxal, but I don't love it and wouldn't wear it very often. I'm happy to spend more on a color that I really love or will wear often, but Paradoxal isn't it. This franken, on the other hand, is perfect. It falls within a price range I will pay for something that's unique but won't get worn very often. Thank you! i keep forgetting the names of the polishes you used. adding to my BB so i can try this. thanks!